ATLANTA (March 20, 2014) -- You don’t need a four-leaf clover to get the luck of the Irish this St. Patrick’s Day. 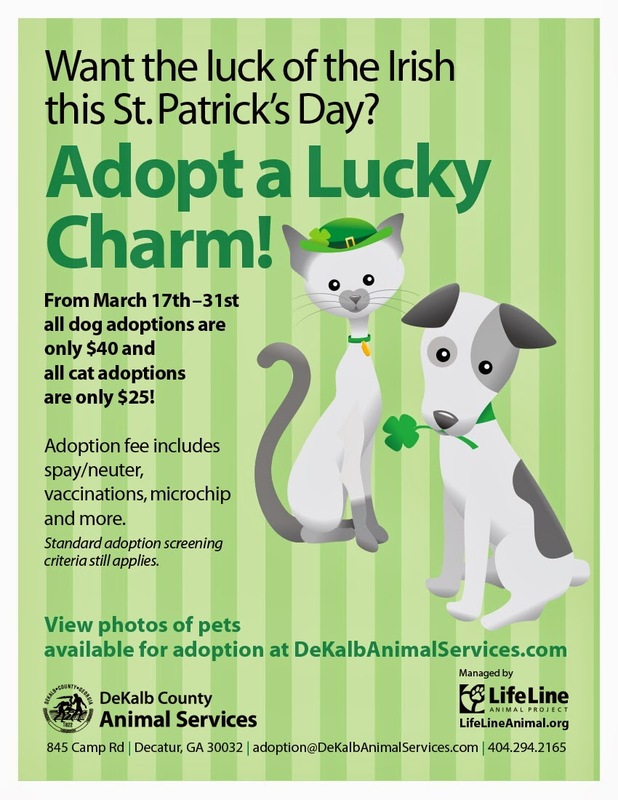 LifeLine Animal Project invites you to adopt your lucky charm at DeKalb County Animal Services (DCAS) and receive special adoption rates during their ‘Adopt a Lucky Charm’ promotion. During the month of March, any dog or puppy may be adopted for only $40, and any cat and kitten may be adopted for only $25. Standard adoption screening criteria still applies. Adopted pets will be spayed or neutered, microchipped, vaccinated, heartworm or combo tested and dewormed. To see pictures of available animals at DCAS, or for the shelter’s address or adoption hours, please visit www.dekalbanimalservices.com.